Thanks so much for sending over the HotPot. It came a week ago, and I have been waiting for the weather to clear in order to give it a good try. Today I took the kids and their friends to the beach. It was a beautiful day for a swim and we had a great time. I brought a Cookit, a funnel cooker and the HotPot as I wanted to cook both lunch and dinner. The HotPot's cooking bowl is so big I was able to scale up my solar chicken recipe which means leftovers - yummm! The bowl is HUGE and the amount of food it can cook is quite impressive. 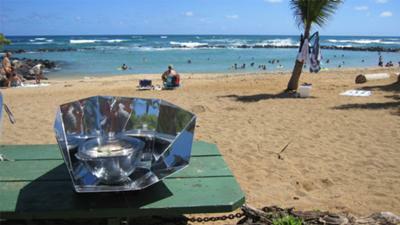 The reflector is nicely made and very efficient for midday cooking. Overall, the HotPot is a very well designed product that absolutely delivers what is promised. Thank you for your opinions and feelings about the Hot Pot, these will be helpful to others contemplating the purchase of a Hot Pot, I hope you continue to enjoy it.